Weddings and flowers go hand-in-hand. From the bouquet to the centerpieces, floral arrangements often take center stage. But when the wedding is over, so is their time in the spotlight. Now, one female-led startup called Bloomerent is hoping to prevent expensive flowers from ending up in the garbage after just a few hours. The service aims to help brides save money and reduce floral waste by sharing their wedding flowers with another event. Through the online platform, event hosts can plan to share their flowers with another event in close proximity. Users can list the centerpieces they’re willing to share or “opt into” a centerpiece originally used at another wedding. Julia Capalino, who co-founded Bloomerent with Danit Zamir, says wedding flowers have a much longer lifespan than many people realize. "There's a misconception that when the wedding ends, the flowers die,” said Capalino, in a statement. “The reality is that flowers have a lifespan of 3-14 days depending on the flower and we work directly with the experts to make sure they are perfect for both events." Those experts are top-rated florists who share Bloomerent’s goal of reducing floral waste. They also strive to make sure the centerpieces look fresh and beautiful even after their initial debut. And the flowers aren’t the only ones getting a sweet deal; customers and florists win, too. “A bit of fragrance clings to the hand that gives flowers,” the proverb goes. In this case, the metaphorical fragrance will be twofold: a lighter conscience from not having to throw away living flowers and money back. Customers who share their arrangements receive a portion of their money back. The amount will vary depending on whether their event is the first or second stop on the flowers’ journey. 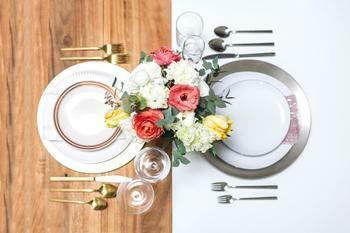 But in an age where weddings cost an average of $30,000 (with florist fees setting many couples back around $2,000), every little bit of savings helps.